In a large bowl, stir together Bisquick™, coffee, milk, eggs and crumbled bacon until combined. Ladle slightly less than 1/4-cupfuls of batter onto a hot, greased griddle or skillet. Cook 2 to 3 minutes until golden brown on bottom and bubbles form on top; flip and cook another 1 to 2 minutes. Repeat with remaining batter. Combine maple syrup and coffee in a small bowl. Pour coffee syrup over warm pancakes. Top with more crumbled bacon and whipped cream, if desired. If you think pancakes couldn’t possibly get more awesome, clearly you haven’t met Bacon and Coffee Pancakes – the new cool kid of breakfast. 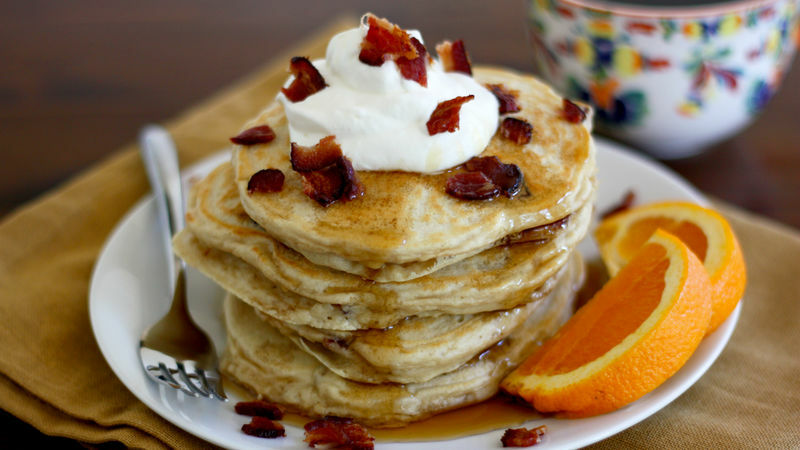 Instead of having your coffee, bacon and pancakes separate for your morning meal, you can have all of them in flapjack form. OK, you can have some extra coffee and bacon on the side, too. I totally support that. You’ll need just a few ingredients to get things started. I lovelovelove using Bisquick to make pancakes because I always end up with the fluffiest, most perfectly cooked, tastiest cakes. You’ll also need some milk mixed with strong coffee, eggs and a few slices of cooked bacon. Combine the Bisquick, milk, coffee, eggs in a bowl; crumble the bacon and add that in there, too. Stir everything together until it’s all friendly and well combined. Heat a large griddle or skillet and brush the surface with oil. Ladle the batter onto the griddle and cook on both sides until golden brown. Easy-peasy, that’s what this is! Transfer the cooked pancakes to a plate while you cook the remaining batter. Finally, stack the pancakes on serving plates, top with whipped cream, crumbled bacon and coffee-infused maple syrup, and EAT. It’s the only way to celebrate National Pancake Day, really. Please tell me I’m not the only one who wants to snuggle up inside that stack o’ pancakes. BUT SERIOUSLY. Stephanie (aka Girl Versus Dough) wants to eat these cakes for breakfast everydayalldayforeverandever. Check out Stephanie’s Tablespoon member profile and keep checking back for her own personal recipes on Tablespoon!